love the colors here! Very interesting photo! Gorgeous lighting! Color for me ! Congrat ! Visit my blog. A friend of mine, Miguel did a special blog for Madrid in Spanish. You might like to see it and leave a comment in Spanish if you wish. I tant que no em rendeixo !!!! segueixo veient les meves princeses en els seus 'juncos'. Si aconsegueixo viatjar en un d'ells, crec que no em veureu més. Em quedaré entre les meves aigües cristallines per somiar tots els meus records i desitjos. Saps que aquestes obres son la meva debilitat. The gold reminds me of flames. Beautiful! Oh I love that color shot. the reflection, the crumpled interesting shapes. At first I thought of a butterfly, then a leaf. I love how your photos tweak my imagination. Maravillosas. Me encanta en color Leovi. Como rendirse si uno ya está derrotado. Por cierto he leído el mapa y el territorio y a continuación La posibilidad de una isla, genial ambos libros, aunque no ayuda a levantar el ánimo. Después de esta dosis de "optimismo vital" voy a releer La conjura de los necios a ver si consigo arrastrar una sonrisa. Lo normal es que abra unos instantes, mire, cierre y retome unas horas después para ya observar,desmenuzar y comentar. Hoy mi primera reacción fue un ¡ Ohhhh !... como si hubiera visto una aparición. La niebla, el agua y sus efectos ópticos alteraron hasta la magnitud de las palabras. La observación se convirtió en contemplación, el examen se tradujo en un recreo para la vista y el comentario no podría ser otra cosa sino el más sincero reconocimiento a tu obra de hoy. Una de mis preferidas si no la que más. Me alegro mucho Juncal, Besos. Algo se ilumina en la eterna maravilla de tus instantes. Magical! Love your style and colours! Love this....the colors are brilliant! Love how the reflections are just as beautiful! Love the blue -- gorgeous! Great colours and reflection!! Boom & Gary of the Vermilon River, Canada. I love the swirling touches of blue ... one of which is a heart!!! Beautiful how this is hot and cool at the same time. That little accent of blue is stunning! So mysterious how the forms are reflected by and sink into the silvery, watery surface they're floating on. So much to love about this glowing creation. Lovely lemony colors. Nice creation. Ahhhh - the light, the reflections, the soft tones - stunning! 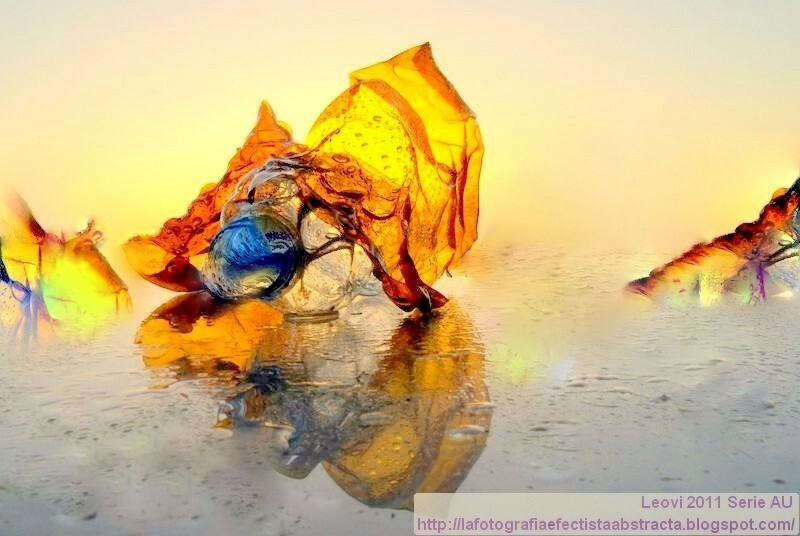 Thank you for sharing your art with Photo Art Friday, Leovi. Lovely, beautiful colour and so warm in feeling. I really do like the colors in this one. And there are a lot of different things in which to get distracted. I see two little fairies, one blue and one purple watching over their cave in which a waterfall is flowing, and they have to guard it very well because it is The Golden Cave made of pure gold. I can also see the pterodactyl at the mouth of the cave on guard duty also. While lurking in the waters below are a few more mysterious creatures. Thanks for sharing this beautiful distraction for this weeks Theme Thursday. Es la primera vez que visito su blog, pero ya me quedo. Enhorabuena por su interesantísimo trabajo, que reúne calidad fotográfica y gran imaginación para expresarse. Desde luego, rendirse nunca, no hay que perder la esperanza, aunque esa naranja como tu magnífico paisaje abstracto. Spectacular, I see a woman with blue hair hauling a heavy load. I love this. I didn't want to stop looking. Strong and fragile, very beautiful! Always a wonderful experience to see your latest art works. Beautiful as always, Leovi! Wonderful colors reflected on the water! Superb! This looks like the beautiful sunrise after a stormy night. Love the colors and reflections in this leovi! Mine is up- hope you can stop by.. I love the way this makes reflections. Always creative, always beautiful. It's fun to image what your images remind me of and this one reminds me of a beautiful seashell on a tropical sunlit beach. There are a lot of details and the color is extraordinaire. Just great Leovi. Magical and mysterious, both elements draw viewers like myself to see more. I really like this. It looks like a beach on another planet. Great job. Nice colors and dreamy processing! So interesting to see the value differences when in black and white. great color combo again. Thank you for linking up from last week's Color connection. come and join again this week, the linky is up now.